TeslaTesla sent line workers home early on Wednesday. Employees assembling Model 3 vehicles at Tesla’s Fremont factory on the GA3 line were sent home early from shifts this week, three Tesla employees told Business Insider. One factory worker said the GA3 line, which is the main assembly line for Model 3 production, was sent home early on Wednesday without meeting goals. The worker said roughly 211 Model 3 sedans were assembled before workers were sent home three and a half hours early from their typical 12-hour shift. The employee said the company aims to make 300 Model 3 vehicles per shift on the GA3 line. In early July, Tesla CEO Elon Musk sent out a company-wide email celebrating the Fremont plant hitting the 5,000-cars-per-week benchmark, and saying the factory was on track to raise that figure to 6,000 cars a week. The worker said the email “was laughed at,” as the GA3 line has rarely hit its benchmarks. Tesla declined to comment on whether GA3 line workers were being sent home early and about internal targets for the Model 3. On Wednesday, Tesla factory workers putting together the Model 3 on the GA3 line were allowed to go home early from the Fremont, California plant, leaving at 2:30 p.m. PT, instead of the usual 6 p.m., three Tesla employees told Business Insider. The employees spoke on the condition of anonymity for fear of losing their jobs. Workers on GA3, which is Tesla’s main assembly line for the Model 3, were also sent home early on the night shifts that started on Tuesday and Wednesday evenings, an employee said. At the time of publishing on Thursday, normal operations had resumed. Typically, a worker told Business Insider, a shift is only sent home early because it met its goals for a period of time or because there is a problem that is making it impossible to assemble more vehicles. For example, one of the two lines on GA3 might be sent home if there is a problem that has prevented the progression of assembling vehicles for hours. In this case, both lines were sent home, with the entire GA3 line leaving early. According to a factory worker, the reason was not because the company had hit its production goals for the day. In fact, the worker said the company missed internal targets. The employee said the target is to produce 300 cars per shift (there are two 12-hour shifts per day), but on Wednesday the line produced 211 vehicles during the day shift. Tesla declined to comment on whether GA3 workers were sent home early and about internal targets. The number of cars completed per shift is displayed on a screen for line workers at the factory. 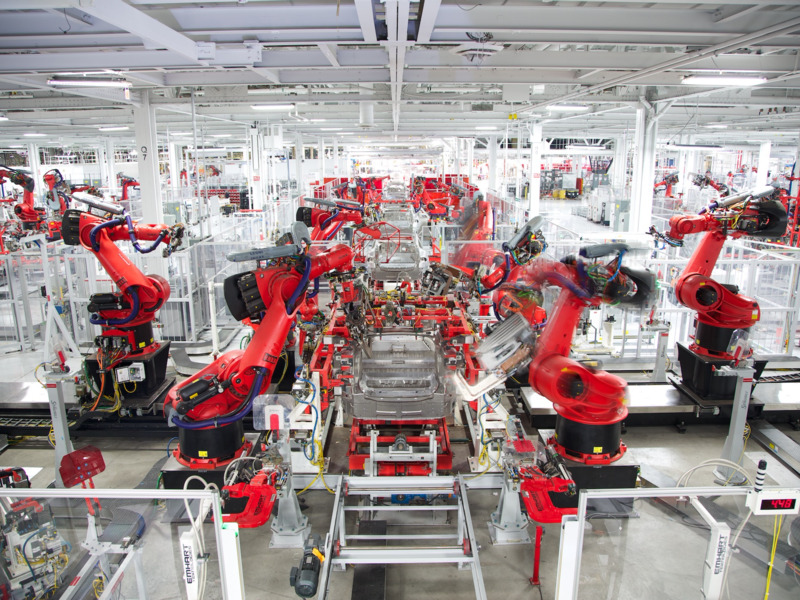 Not meeting the required numbers is a common problem in recent weeks, the factory worker, who has been at Tesla for a little under a year, said. According to this worker, his 12-hour shift is supposed to push 300 cars through the line, as part of Tesla’s aim to get 5,000 Model 3 cars assembled per week. However, his shift has only reached this goal roughly three or four times in the last three weeks, he said. “The days we even hit 300, we celebrate it in the morning,” he said, adding that there have been very few celebrations recently. According to the worker, each station at the plant (such as body wiring, pedal assembly, and airbag installation) is supposed to take roughly two minutes on average. However, internal information shared with Business Insider showed that on Wednesday, nearly every station was running over time, blocking the progression of cars down the line. In early July, Elon Musk reportedly sent a company-wide email celebrating the Fremont factory hitting the 5,000-cars-per-week milestone. “We barely could get to 5,000,” he said. 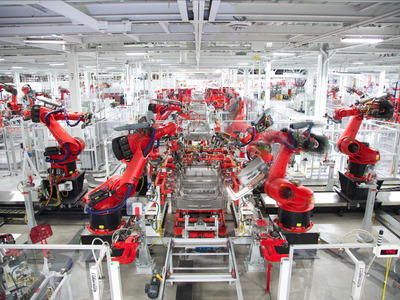 Tesla, though, has managed to reach goals despite shifts coming up short of expectations in the past, with unconventional solutions such as creating new assembly lines. In June, Musk revealed the company had built a new line for Model 3 production, dubbed GA4, in a giant tent outside the Fremont factory. Reuters also reported in late June that shifts were failing to meet the 300-car-per-shift goal, making it unlikely the factory would meet the 5,000-per-week mark. Three days later, Reuters reported that the factory hit the 5,000 car milestone. Additional reporting by Linette Lopez and Mark Matousek.